Its because of our friends, family and great clients like you that have helped with our success. We couldn’t be where we are today without all of you. As a token of our appreciation this holiday season and our way of saying Thank You, we’ve got a FREE PIE with YOUR name on it! Trust us, these are delicious and HUGE and you won’t be disappointed! Step 1: Reserve your pie by November 9th. Simply use the form below or give us a call at 508-232-7926. 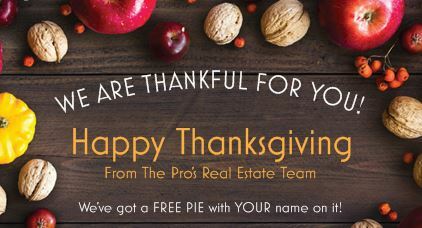 *Free pies are reserved for current and past clients of The Pro’s Real Estate Team. If you feel you have landed here in error, please let us know and we will update our records.